Stephanie does it again with a great Flickr album from the festival. We had a respectable turnout on Saturday despite the chilly, rainy weather. Sunday was beautiful. 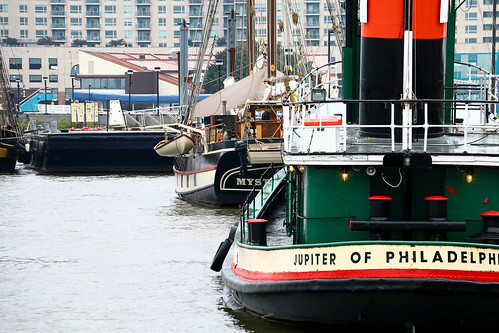 Shown here is our beloved tug Jupiter in front of New London, Connecticut’s Schooner Mystic Whaler. Come see Gazela this weekend at the Old City Seaport Festival. Tickets and event info can be found on the festival website. You can also find info on attending tall ships here. When you hear the words, “Hazardous Materials”, do you think of ship preservation? Tar, turpentine, linseed oil, paint and all the other preservatives used in the course of our work would make a mighty fuel source. In the interest of reducing our stockpile of old hazards, the volunteers are asked to help with a clean-up of the barge. Philadelphia is holding a Hazardous “Ship”-hold Waste Disposal day on October 18 between 0900 and 1500. We’d like a couple of drivers who have pickup or trucks and live in the city limits to help move the pile for safe disposition. We’ll also need hands on October 18th, from 0800 to 1000, to offload materials from the barge to the vehicles. A beautiful view of tall ships from Penn’s Landing, October 22, 2013. Thanks to all who helped get Gazela ready for Baltimore. It was a big push to get her painted and rigged. There are still some items to finish up and gangway boxes moved around before the next big event. I’m willing to host two Wednesday night work parties (Oct 1 and Oct 8) to finish the rig tarring on the foremast. Be nice to have shiny stays. Gazela’s next public appearance is the Old City Seaport Festival on October 10-12. The Guild would also love your help with the WHYY Membership Drive on Saturday October 18, from 8-11 am. While helping WHYY, the Guild gets great publicity for the crew and ships. Baltimore was very welcoming to us and it was an amazing opportunity to work with our friends on other tall ships. Check out this great clip from Baltimore’s local CBS affiliate featuring reporter Tracey Leong at Gazela’s wheel. Here’s another news clip from WBAL-TV featuring our captain, Scott Cointot. Crewmember Stephanie Farra took some great photos of her shipmates and Baltimore. Check out her Flickr photo set. 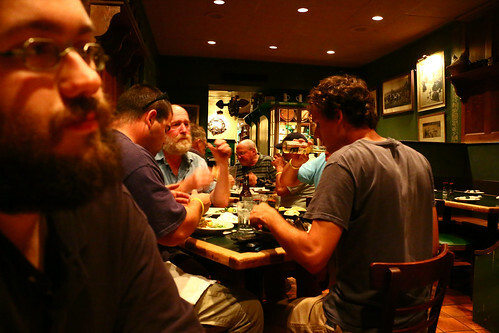 Shown above is a crew night out at Bertha’s Restaurant & Bar in the Fell’s Point neighborhood, where visiting crews received a 20% discount. Thanks Bertha’s! The food and service were terrific. Update 9/22: Stephanie also created a beautiful photo essay on her blog. See it here. Gazela docks at Baltimore Inner Harbor next to Constellation on the morning of Sept. 10. Gazela departed Penn’s Landing shortly after 10 a.m. for the Star-Spangled 200 in Baltimore. We expect to anchor at the mouth of the Sassafras River tonight for arrival in Baltimore tomorrow. Photo shows sails up on the Delaware River. Gazela will be taking a trip to Baltimore in September as part of the Star-Spangled Spectacular, a huge, multi-day celebration to mark the 200th anniversary of the writing of the Star Spangled Banner. Gazela is going to be playing an important role in this event, as she will be serving as the backdrop/centerpiece of this event, so from now until early September we will be working hard to get her ready for her appearance in Baltimore, and we will need as many hands as we can get to help out with this, even those who do not intend to sail. Right now the dates that we are working with are the 8th -18th of September; the ship would be leaving on the 9th, arriving on the 10th, staying in Baltimore until at least the morning of the 16th, and arriving back in Philadelphia on the 17th or 18th. Even though the ship is not projected to leave until the 9th, all crew who are sailing on the trip down will need to be on the ship on the evening the 8th to help ensure that both the ship and her crew are ready to get underway.